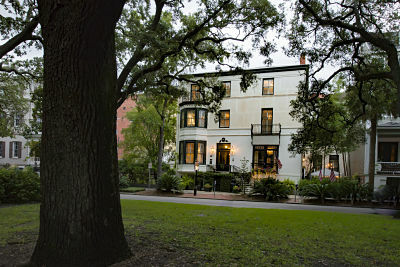 The Ballastone's Babymoon Package is the perfect selection for expectant mothers; there is no better way to see the beautiful city of Savannah and enjoy a romantic getaway before welcoming your little one into the world. The certificate to Spa Bleu will feature a 1 hour Prenatal Massage or Calming Rose Chamomile Facial, a Spa Pedicure, Afternoon Tea, and your choice of Organic Aromatherapy. Get off your feet and take a romantic and relaxing tour through the city on a private horse drawn carriage. Partake in silver service afternoon tea. Dine at one of the fine local restaurants and return to your romantic chocolate covered strawberry and rose petal turndown. Take home two Ballastone signature coffee mugs for those lasting memories. Select one of the rooms with a romantic fireplace and a Jacuzzi tub to be sure to have the perfect Babymoon getaway. Lucille's Mountain Top Inn & Spa is beautifully situated on a small mountain top just off the historic Unicoi Turnpike and overlooking the pristine Blue Ridge Mountains and scenic Sautee Valley. The inn is specially designed to make the most of the stunning views and has a reputation for the finest comforts and conveniences. With its primary design influenced by American Arts and Crafts, the inn features many areas paneled in dark heavy wood and you will enjoy the Arts and Crafts design touches throughout. Features include etched window panes, angular stained glass light fixtures, and an open main staircase. The inn boasts a full-service day spa, decorated in soothing green tones and ideal for promoting a little rest and relaxation on your babymoon. The ellis Hotel is a boutique hotel located in the heart of vibrant downtown Atlanta. Only steps away from all the excitement of the downtown area, the hotel itself is an oasis of calm, with a relaxing ambiance, luxury accommodations and upscale amenities. Can't get away for an overnight babymoon? Explore our Georgia One-day Babymoons.